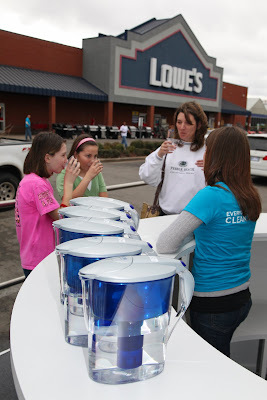 We visited the PUR Water on Wheels Tour at a local Lowe’s. The Water on Wheels Tour has several activities and lots to learn about clean water. The PUR station offers taste tests comparing local water with their filtration pitchers and without. The water from the PUR filtration pitchers had a clean, fresh taste compared to local water which tends to have an odd taste and odor to me. There were also samples of their new flavored waters that have zero calories and zero sugar. I love flavored water because they are so much healthier than soft drinks but still give you a little kick when you want something more than plain water. PUR offers raspberry, strawberry, lemon, and grape flavor cartridges that go on top of your PUR pitcher. I’ve used the PUR water filtration pitcher in my home so I already know that I like PUR for their great tasting water. However, until today I didn’t know that PUR is also reaching out to help provide clean water to developing countries. There is a display at the event about the Summit on the Summit and the trek up 19,340 feet to the top of Mt. Killimanjaro to raise awareness of the water crisis throughout the world. There is even a climbing wall on the side of the truck but you must be 18 years or older to climb it. Fortunately, Nicholas was content to just get his picture next to it. I’m amazed at that PUR has technology that can turn the dirtiest looking water into clean safe drinking water for people in developing countries. Check out this video by PUR and learn how your purchase of a PUR filter system can provider 10 liters of clean water for those in need. That’s something to feel good about! PUR will also donate 10 liters of water to developing countries for each person that signs up as a fan on the PUR Facebook page. Want a great deal for yourself? If you purchase a PUR pitcher or faucet system during this event at Lowe’s, just bring it to the PUR truck in the parking lot and you’ll receive a free replacement filter!